This is a great script by Khalil Gibran that I came across. I found an OK translation below. Do not love Half lovers .. do not entertain Half friends .. do not indulge in works of the Half talented, do not live Half a life .. do not die a Half death .. If you choose silence, then be silent .. when you speak, do so until you are finished .. do not silence yourself to say something, and do not speak to be silent .. if you accept, then express it bluntly, do not mask it .. if you refuse then be clear about it, for an ambiguous refusal is but a weak acceptance ..
Do not accept Half a solution .. do not believe Half truths .. do not dream Half a dream .. do not fantasize about Half hopes ..
Half a drink will not quench your thirst .. Half a meal will not satiate your hunger .. Half the way will get you no where .. Half an idea will bear you no results .. Your other Half is not the one you love .. it is you in another time yet in the same space .. it is you when you are not .. a life you didn’t live, a word you have not said, a smile you postponed, a love you have not had, a friendship you did not know .. to reach and not arrive .. work and not work .. attend only to be absent .. what makes you a stranger to them closest to you, and they strangers to you .. The Half is a mere moment of inability .. but .. you are able .. for you are not Half a being .. you are a Whole that exists to live a Life .. not Half a life. I went to the Tsukiji Fish Market in Tokyo really early in the morning to see the Tuna Auction. The Tuna Auction area is world famous and been mentioned in many travel guide books. When I visited Tsukiji before, one of the tourists told me that many famous food authors considered Tsukiji the best place to get sushi. I checked to make sure that the market is open on Saturday and went there. After the auction, I went and stood in line to go a place called 大和 (Dai Wa – there is another reading way but I think Dai Wa is the correct one). The place next to it is called 寿司大 (Sushi Dai) and I visited it on my last trip to Tsukiji. Overall, I would say that Sushi Dai is better even though the wait line at Dai Wa is longer. 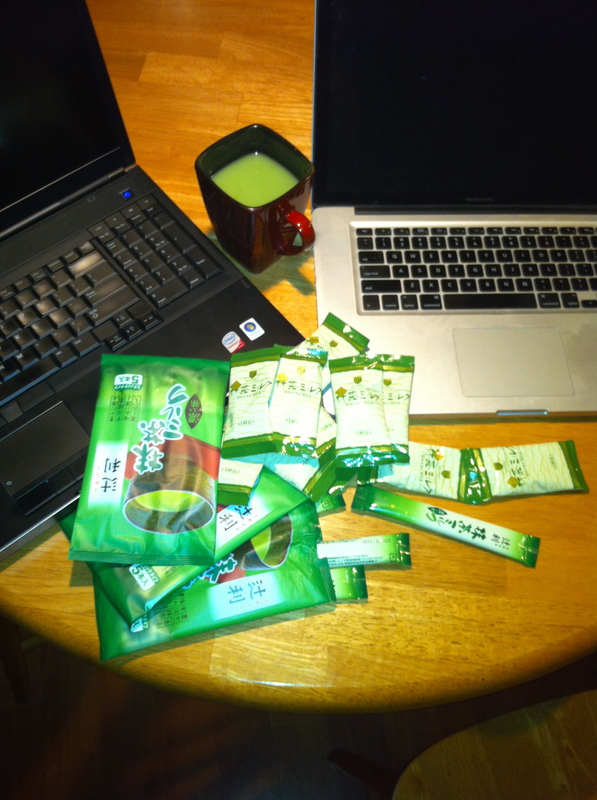 When I lived in Japan, I used to drink Matcha tea everyday. Matcha is a finely-milled Japanese green tea. I usually add honey to my Matcha with a little bit of milk and it becomes the world’s best drink. Hot or Cold! At the convenient store in Japan, you could find Matcha Milk which already includes the Milk. All you need is hot water and if you like it sweet, add a little bit of honey and you are set.